Playmates takes over the license from Mezco,* who have recently been re-releasing their earlier Family Guy figures with what seems to be (as far as I can tell) mixed success. I used to be a big Family Guy fan, but I stopped watching it this season–along with every other Seth MacFarlane show–and haven’t missed it. One shouldn’t assume one’s own tastes reflect the majority’s, but it does seem to me that Family Guy may be on the downward slope of its popularity. Ever since the Fox Kids Turtles cartoon ended, Playmates has been floundering a bit. Their Star Trek and Terminator: Salvation lines were rushed, forgettable, and are still keeping pegs warm across the country. I am intrigued by their new Lucha Libre USA figures (more on that at a later date). But I have a hard time envisioning Family Guy becoming the smash hit World of Springfield was. Not that everything needs to be a smash hit, but Playmates does mass market retailer lines–not the collector’s market–so if the sales aren’t there, the line won’t be for long, either. * I’m assuming. It’s possible Playmates made a deal that allows Mezco to sell their figures in specialty stores–it’s happened before. On the other hand, this wouldn’t be the only major license Mezco lost in recent history. Playmates probably figured that since WoS came out about 10 years into the Simpsons (not county their Tracey Ullman days), coming out with Family Guy stuff 10 years into the show's history couldn't POSSIBLY fail! Here's the problem, though: I know a lot of people who genuinely loved the Mezco stuff, and just like WoS, I think Mezco just kind of let things slide because they ran out of characters and interesting main character variations to do. But the big problem you have, because of the Mezco line, is the comparisons. When The Simpsons was made, there was a HUGE pent-up demand for Simpsons merchandise, especially for second and third tier characters, and the only other action figures made for the Simpsons was the kind of subpar Mattel line from 1990. Mezco produced a nice quality line that tackled all of the main characters as well as many obscure ones, and so Playmates is going to draw comparisons. I don't know about anyone else who collected WoS, but the talking feature was NOT the biggest selling point for me. If that's what Playmates is banking on, they'll probably struggle. AND ONE LAST THING. When The Simpsons figures were out, they were CHEAP! For the first couple of years, they retailed for $4.99 each, and for that, you got a figure that interacted with an environment with a lot of character-specific accessories. There's no way 10 years later that Playmates can make these figures nearly as affordable. I completely regret collecting WoS. The figures were decent, but largely unspectacular, though it was really the horrible writing on The Simpsons for the last 10(?) years that just killed my love for the characters. It is one of the few lines that I completely sold off (at a huge loss) and along with pre-Marvel Legends Marvel figures, one of my biggest regrets in collecting. I will not make the same mistake with Family Guy, which has similarly turned into crap. As was stated, I really don't think there is much demand for figures from this license. I saw this too on the BBTS page and then found the story on Toynewsi.com. I have a few Mezco Family Guy figures, and thought they were really well done. I was hoping that due to the rereleases that were showing up in TRU stores, perhaps Mezco was planning on continuing the line. I like the Family Guy characters. My biggest problem with the show in recent years is that it has often seemed to make characters and comedy take a back seat to Seth McFarlane's politics, but that is neither here not there. If these were at the right price, easily available, featured a good selection of characters, and said funny things, I could see myself possibly getting into them. I must admit I like the show, but then I have no idea what season we are on in the UK, so the rot may have yet to set in. That said, these seem uninspiring to me and I'll pass. I like Family Guy but I'm just not interested. I'm definitely interested in these. I still love Family Guy and don't really understand why folks say it has gone downhill. For that matter, I don't understand why some folks bash The Simpsons these days. In the case of Family Guy, I think it is as strong now as it ever was (with the exception of their second Star Wars spoof – they totally phoned that in). And while The Simpsons might not equal its best years, it is still one of the smartest, funniest shows on TV. 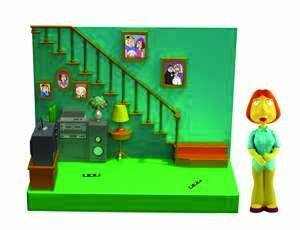 As for the toys, I have a few of the Mezco Family Guy figures, but I'd consider replacing them with new WOS-style ones. I was finishing High School and starting College when WoS was hitting the shops and didn't bother collecting them even though I was a big Simpsons fan. I do regret it. 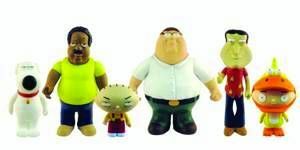 Having said that I love Family Guy, so if these are in the shops I will be picking some of them up. Meh! That's all I have to say. The only playmates news that I'd care about involve 4 turtles and a guy who wears a bunch of graters as armor. WOS was great, so I'll probably pick up at least the first few waves of these. Though I don't know that there are more than a dozen or so figures I would really be interested in. I don't see this line lasting long term though. Doesn't help that these cost quite a bit more than the Simpsons figures did. I would actually be more interested in them picking up the Simpsons line again.